I don’t know about you, but some summer mornings I just need some sort of light cap to wear when I walk Deedle (okay, so it’s mostly to hide my unruly locks). I’d been thinking of knitting one for a while, but when I saw the Vortex pattern in the Winter ’08 Knitty, I knew I had found The Pattern. 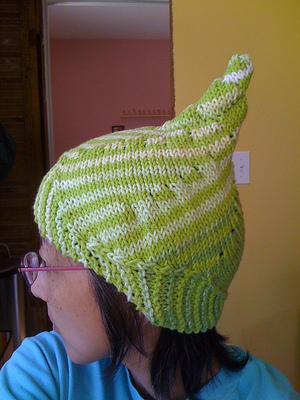 The Vortex pattern is really fun and interesting to knit, and the pattern is very clever. I have no idea how the designer ever figured out how to write the pattern, and you know, I had no idea how the thing was supposed to look or what I was doing until the very final step of grafting the ends together. My “make 1” stitches are ugly, as you can see, but who cares! I love the hat. I used Sugar ‘n Cream or Peaches ‘n Cream or one of those cream kitchen cottons. I think I have enough yarn left to make a non-pointed version. Peter thinks I look like an oompa loompa with it on, but there’s nothing really wrong with that, is there? As long as you don’t get some bad self tanner and turn yourself orange, I think you’ll be fine. he’s just pissy because you didn’t make him one. I WANT ONE TOO. Awesome hat! It looks amazing on you. That is wild! It must have been fun to knit. Your M1s look fine. Very fun. Perfect for morning walkies. And cute. It’s very festive. Oompa loompas rock! Deep Roy is someone to look up to (even if you have to look down to do it). Go, Oompa Loompa, Go! OMG i love that. ARGH i will i could knit a hat so i could make that.. DO YOU TAKE COMMIsssion? yum and Hi. i follow your blog and always appreciate your posts. I wanted to let you know that the endless.com has the terra plana vivoballet slippers on sale for 40% off. they only have them in black and the sizes available are 6 and 7.